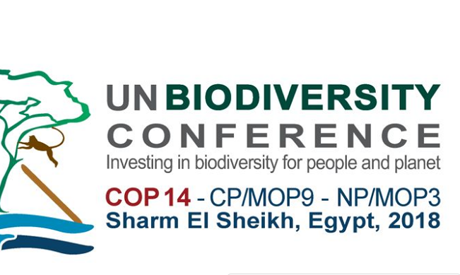 The UN Biodiversity Conference (COP 14) will officially kick off in the Egyptian Red Sea resort city of Sharm El-Sheikh on Saturday, four days after African ministerial meetings discussed the continent's biodiversity priorities and future work plans. Amid reports of an alarming decline in the variety of plant and wildlife, the conference aims to send a clear message that preserving biodiversity and the health of the ecosystem is fundamental to life on earth. World biodiversity has declined by almost one third in the past 35 years, mainly due to the loss of habitat and the wildlife trade, according to World Wide Fund for Nature (WWF). The Fund also said last month that worldwide vertebrate populations are set to decline by 60 percent by 2020 from their 1970 levels. The conference, held every two years, is expected to discuss key measures to speed up actions to advance the Strategic Plan for Biodiversity 2011-2020 and review progress made towards its 20 Aichi Biodiversity Targets, a set of agreed objectives on biodiversity conservation and sustainable use to be reached by 2020. The gathering, which runs from 17 to 29 November, also aims to develop a post 2020 global framework on biodiversity to be adopted in Beijing, China, where the next round of the conference will be held. The conference will also feature meetings on the UN’s 2003 Cartagena Protocol on Biosafety meant to help regulate trade in genetically modified organisms (GMOs) and the 2010 Nagoya Protocol on genetic resources. In the lead-up to the conference, an African ministerial meeting was held on Tuesday, and a two-day ministerial high level segment opened by Egyptian PM Mostafa Mabouly was held afterwards to discuss the mainstreaming of biodiversity into the major sectors of energy and mining, infrastructure, manufacturing and processing, and health. This round of the conference marks the 25th anniversary since the entry into force of the UN Convention on Biodiversity and will highlight progress made in the achievement of its objectives. The conference will also see the announcement of the Sharm El-Sheikh Declaration, which introduces measures to minimise impacts on biodiversity and streamline biodiversity across all sectors. It is the 14th gathering of its kind held by the Conference of Parties (COP), the body governing the UN convention. The 13th meeting was held in Cancun, Mexico in 2016.